I think the $200 price point is one of the trickiest to shop for when it comes to grills. Let me explain. This is the range in which most new grillers feel comfortable spending to get a home grill. That means, manufacturers flood the market with grills at this price point, all with identical or nearly identical features. Seems like a good thing right? It actually makes the shopping process more challenging because now you have a ton of options, all claiming to be spectacular, but you don’t know which ones really live up to the hype. The Final Sear: The Char-Broil Classic 360 3-Burner is my favorite grill in this category. Packing 3 burners and an impressive 360 sq. inches of cook area, this thing is a beast for the price. It is quality built and should last many grilling seasons. At $200, a quality grill isn’t going to have all the bells and whistles like a built-in rotisserie kit, flavorer bars and a ton of space. But, if you choose the right one, it should fulfill it’s primary purpose like a champ and grill consistently and smoothly. Ignore the marked down deals at Walmart that include everything under the sun. That’s exactly how to wind up with a cheaply-made grill that barely reaches desired temps and instead of laying down some nice sear marks on your steaks, leaves you with a floppy, unevenly cooked piece of meat. Which grills will really perform? I have sorted through a mountain of options and narrowed it town to the top three $200 grills: the Char Griller Grillin’ Pro, the Char-Broil 2-Burner Single Door and the Easy Assemble 3-Burner Gas Grill. The Char-Broil Classic 360 3-Burner is a top-performer for the under $200 category delivering 3 burners and a powerful, reliable experience worthy of the higher price ranges. Sometimes you can snag the 4-burner version for under $200 during a sale and can check here. If you can that is a steal for the quality. The first thing that jumps out is how much cooking space you get for the price, as well as how much power they’ve packed in. It is the largest grill in our top 3 and you can see how spacious it is just on first glance. Overall cook power on the 360 is a solid 30,000 BTUs, with 360 square inches of primary cooking space and 3 burners. It also offers 170 square inches of porcelain-coated wire warming rack (perfect for corn or veggie grilling) for over 530 square inches of overall cooking area. The side tables on this grill are roomy and great for any prep work you need to do and for keeping essential tools while you’re in the grill zone. The electronic ignition makes grill start up fast and easy, and the stainless steel inline burners offer top durability for a long grill life. Like the other two grills in our top 3, the Char-Broil offers porcelain-coated cooking grates for easy clean up and excellent heat retention and transfer. It also comes with porcelain coated steel lid and firebox for increased durability, especially in poor weather months. This grill is also on a solid cart with 6’’ cart-style wheels so you can move it around your backyard or into the garage for storing during winter months. The side tables do not fold down and are stationery, so if you are looking for something that can reduce in size for a more compact space, this isn’t the grill for you. It is also important to note that this grill has 3 burners, but no dedicated side burner. If that is a key must-have on your list, then look a little closer at the grills in the 2nd and 3rd spots on our list for a better fit. For maximum value for your budget, this is an impressive grill that will perform with the best of them. No grill list is complete without a Weber in the top few spots. For under $200, the Q1000 is a compact, but reliable pick that will last for years while delivering the same quality performance. I know it’s hard to wrap your head around a smaller, portable grill when you’ve been eyeing a 5 burner beast, but don’t let the compact design fool you, this is a great backyard grill option that also gives you a lot of versatility. This isn’t just a glorified George Foreman. The Weber offers a single burner with 8,500 BTUs of power and 189 square inches of overall cooking space. It includes porcelain-coated cast iron split cooking grates that allow for a grill/griddle combo for added versatility. Push button electronic ignition makes start up quick and easy. The infinite control burner valve settings allow you to fine-tune the cooking experience. If the Q1000 will be a permanent backyard fixture, you can pair it with the add-on Portable Cart for a full height grilling experience. My neighbor has this set up and swears by it. He loves being able to use it at home and when he’s on family camping trips. It also gets top marks on Amazon with 4.7 out of 5 stars and nearly 650 reviews. This little Coleman makes the list because it’s affordable, but it’s also the ultimate portable grilling staple for grillers on the move. If you’re into camping, picnicking with friends and family, tailgating, or just have limited outdoor space to use for grilling, this should be your go-to grill. What we love best about the Coleman is the reliability AND durability. This little beast can take a beating while getting carted around on all your adventures and still get the job done. It offers a collapsible design to fit into the trunk of most cars and the stainless steel lid keeps it sturdy and ready to roll. The cook size is also pretty impressive for the portability at 285 square inches, nearly as much as the non-portable Char-Broil. It also offers 20,000 BTUs and porcelain-coated cooking grates for easy clean-up. Coleman also added an Instastart ignition to light up those burners, no matches needed and a removable grease tray to keep clean up quick and hassle-free, which is especially appreciated when you’re on the go and having a great time. The feature we think is the best value is the new Swaptop interchangeable design that lets you switch in a griddle top or stove grates, which is so useful when you’re on a camping trip and need to cook up some bacon for breakfast before switching to burgers and dogs for dinner. Reviewers on Amazon swear by the RoadTrip, giving it top marks with 4.1 out of 5 stars and over 750 total reviews. This cart-style grill from Char-Broil should top your list if you’re looking for an option that falls between the large Megamaster and the ultra-compact Weber. The Char-Broil Performance is a great compact grilling machine that has most of the same features of the larger, 4-burner style that falls in the $300 range. It offers: 24,000 BTUs of total cooking power, 300 square inches of main cook space, a 100 square inch swing-away warming rack, a stainless steel lid, standard electronic ignition for a reliable start-up, and folding metal side shelves for prep work. The cooking grates are porcelain-coated and easy to clean, while providing even heat transfer to whatever you’re grilling. We really like this grill if you’re looking for something more mid-sized and for the price, it’s impossible to find something that delivers more value. This 2 burner from Royal Gourmet is a great mid-range grilling option that has the look and styling of a full-size grill, but in a slimmer package. 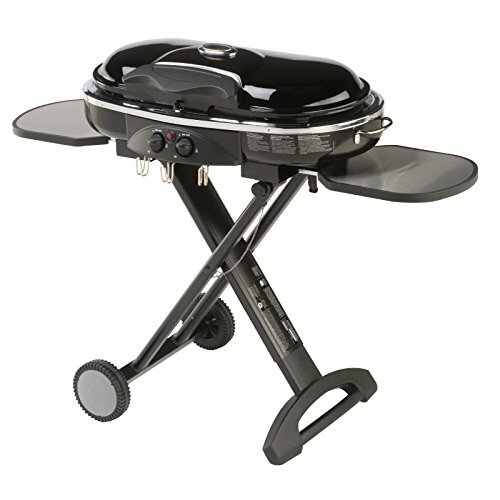 This patio model from RG offers 2 burners and a respectable 24,000 BTUs, 320 square inches of primary cooking area and 96 square inches of warming rack, porcelain-covered cast iron cooking grates, and a porcelain-coated double layer lid (a slight step down from the stainless steel models). I also love that this grill knows its user and includes a built-in bottle opener. So smart. Char-Broil makes some of our favorite grills in the $200-$500 range, but if you’re searching for a compact option under $150, this is a great contender. I also love that the Classic can be purchased with or without the optional side burner for about a $50 difference. This is a nice feature and it’s great to be able to add this on if you’re a little more serious about your grilling game. So what can you expect from the Classic by Char-Broil? This grill offers 280 square inches of cook space (comparable to the RoadTrip from Coleman), 2 burners delivering 20,000 BTUs of power, porcelain coated cooking grates for simplified clean up, and a push-button start ignition system. The optional side burner delivers 8,000 BTUs and is great for sauces or side dishes. The Classic also offers 2 side shelves for cook prep and storage. This is larger, less compact option from Master Cook that is a basic mid-range option. The Master Cook Classic offers 3 stainless steel burners over 473 square inches of total cooking space (125 square inches of warming rack) and 30,000 BTUs of total power. It’s roomy enough to handle 15 burners all at once on the porcelain-enameled wire cooking grates., designed for easy maintenance. Double metal side shelves fold away for storage and are large enough for prep work or holding a stack of freshly cooked burgers while you finish off some sides. The lid and firebox are porcelain-coated steel with a mounted thermometer. This model also offers the standard electronic start ignition you see across the line-up for this category. This is a good mid-range size and pricing option for grillers looking for something larger than a portable. The Cusinart is a solid, less expensive alternative to the RoadTrip from Coleman if you’re looking for a portable option to hang with your on-the-go lifestyle. This is a VERY small grill at just 145 square inches, which can accommodate about 8 burgers or 6-8 chicken breasts in one go. The single burner offers 5,500 BTUs and porcelain coated cooking grate. The construction on the Petit Gourmet is somewhat lacking compared to the other options, comprising mostly aluminum and plastic, but for the price, you’re not expecting all stainless. It comes with a portable stand package so you’re not confined to a table top. It’s also the smallest option on this list and a great pick if you literally need something that could fit in a beach bag or the trunk of your car for outdoor adventuring. Smaller than the Master Cook, the Dyna Glo is similarly priced, but offers slightly less power and one less burner. This model comes equipped with 20,000 BTUs of total cook power across 2 burners and 310 square inches of primary cooking area. It also features a 139 square inch warming rack for sides or toasting those buns. The grilling grates are porcelain-coated, along with porcelain-enameled heat tents for even heat distribution across the grilling surface. There are more plastic parts on this model than we usually like to see and the side tables are stationery. We recommend some of our higher ranked grills over this pick for a higher-quality experience. We consider this model from Thermos to be on par with the Dyna Glo in the #9 spot. It has a similar feature list and overall construction. With the Thermos, you’ll find 30,000 BTUs of overall power for 2 burners, 300 square inches of primary cooking area, porcelain coated steel grates, and folding metal side shelves (a slight upgrade from the stationery shelves on the Dyna Glo). It also has a push-button ignition system for easy start-ups. It has a lower cabinet to hide the propane tank and four casters instead of 2 for roll-away storage. Overall, this pick is a bit of a mixed bag with reviewers and your experience will depend more on your expectation level.